These Cinnamon Toast Crunch Marshmallow Cookies are a super soft and chewy, ooey-gooey cinnamon sugar cookie loaded with Cinnamon Toast Crunch and mini marshmallows. There’s this bakery in Portland called The Pie Spot, and their whole concept of the bakery is mini hand pies baked in a muffin pan. You can order whole pie but the mini pies are way better! Anyway, ironically, my favorite thing to get there is the cereal killer cookies which are either fruity pebble or cinnamon toast crunch. You guys, there’s no stopping me from devouring the whole cookie. I’ve only had the cornflake cookies from Milk Bar one time and I remember them being good but they’re nothing in comparison to the cereal killer cookies. 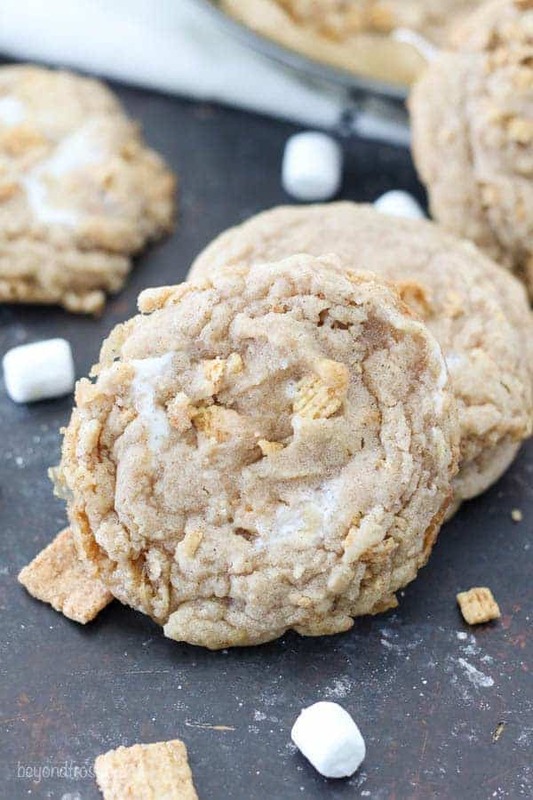 I had to recreate my own version of the Cinnamon Toast Crunch Marshmallow Cookies. These got two thumbs up from my husband, so you know they’re good because he’s a tough critic. Then again Cinnamon Toast Crunch is like one of his top 3 favorite things to eat, so if he didn’t like these, we’d have a real issue. 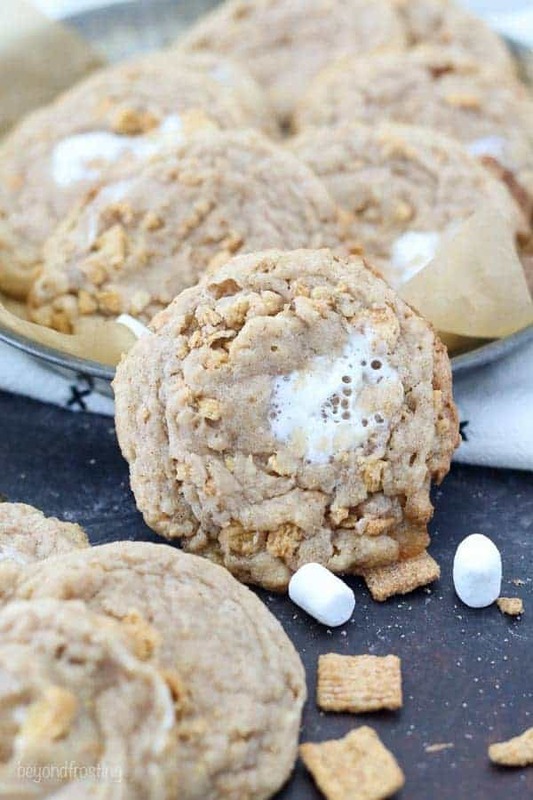 These are a super soft and chewy, ooey-gooey cinnamon sugar cookie loaded with Cinnamon Toast Crunch cereal and mini marshmallows. The ones from the bakery have oatmeal in them, but I wanted to start with my master soft and chewy cookie dough to see what I could recreate. 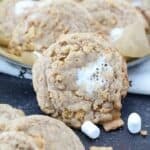 My favorite part of these cookies are the burnt sugar edges and the gooey marshmallow bites! For the Cinnamon Toast Crunch, I just placed it in a Ziploc bag and give it a few smashes with my rolling pin to break it up into smaller pieces. This gets mixed right into the dough. When these cookies come out of the oven, they might be a little misshapen if there are a lot of marshmallows on the edges. 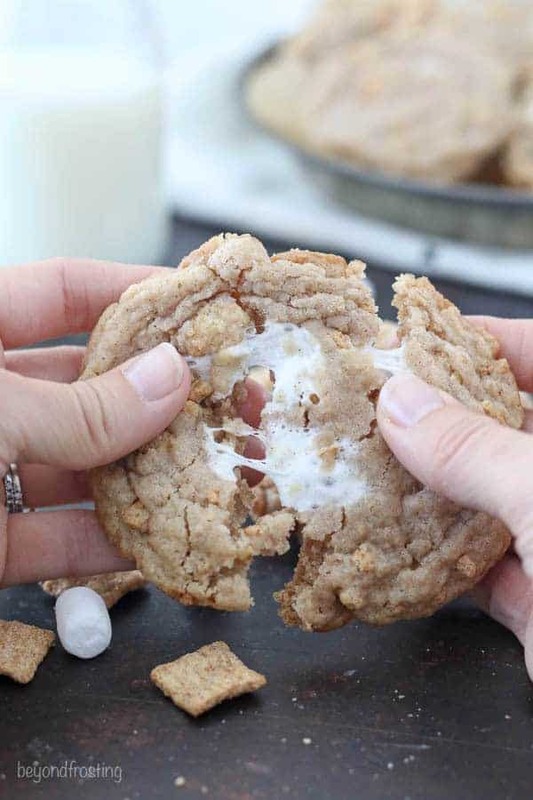 Right when they come out, take the flat edges of a knife and push the edges of the cookies towards the middle and boom your cookies are round again. These cookies are also quite delicate because of the marshmallows, so they’re probably not the best for shipping. If you happen to be stacking them, you might want to consider placing a piece of parchment paper in between each layer. 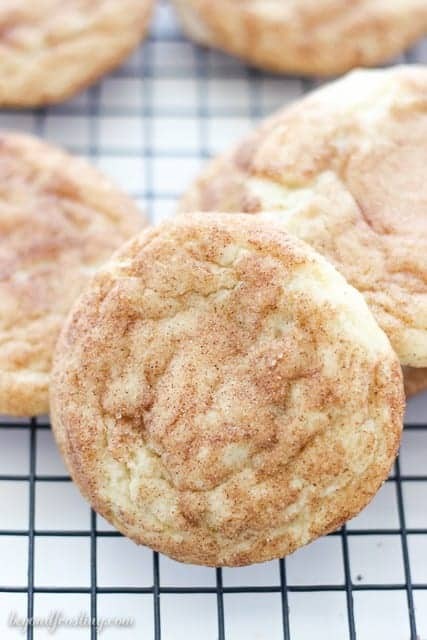 Finally, it’s important that you not skip the step of refrigerating the dough, otherwise your cookies will be flat like pancakes and those are not fun cookies. 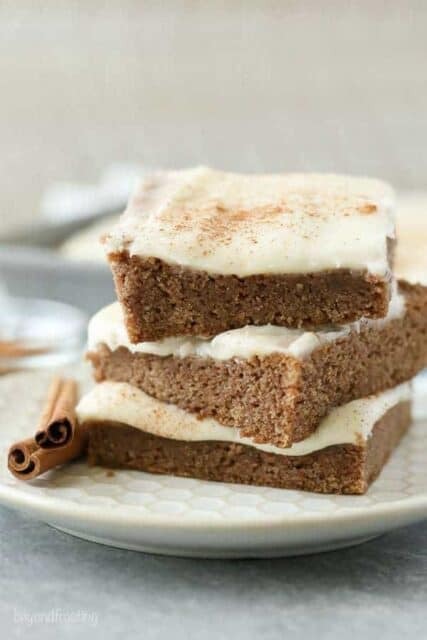 In a separate bowl, combine flour, cinnamon baking soda and cream of tartar. Slowly add into dough and beat on medium low speed until well combined and dough starts to form. Next add the crushed cereal and mini marshmallows and mix to combine. Note: If the cookies are really misshapen, you can fix them right when they come out of the oven. Use the flat edge of your knife and push the edges of the cookie back into the center. Just to clarify, this is one cup of cereal measured BEFORE crushing, correct? Looking forward to trying these! Hi Becca, it is one cup before being crushed. 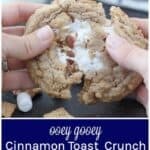 I tried these and the cinnamon toast crunch in the cookie ended up being a very tough, chewy texture. I crunched the pieced very small, but left a couple larger chunks so it wasn’t just powder. Not sure what went wrong but they tasted great nonetheless! Hi Susie, the cereal will not stay crunchy because it is softened when it’s baked. It doesn’t sound like you did anything wrong as far as preparing the recipe. These were delicious!!! Seriously so phenomenal. I didn’t mind having the cereal bits be a bit chewy, but do you have any tips for minimizing this loss of crunch of the cereal? Is it better to crush them up into smaller bits, or should they be slightly larger? Hi Amber, I would probably crush them up smaller, but I don’t think there’s a lot you can do to avoid it unfortunately. I made the Cinnamon Toast Crunch cookies. They were amazing! Three people asked if they could take some home. I did one stupid thing. I cooked them to long. They didn’t look cooked after 12 min so I cooked them longer and then that took the chewy ness away. Some were nice and soft and some weren’t. However I learnt for next time cause there definitely will be a next time and try again. GREAT RECIPE! Hey Linda!! I am so glad they were a hit!! Sometimes I do a “test” batch and bake 2-3 at a time so I can see if I need to adjust the time. Every oven is different! I can’t wait for you to make them again. 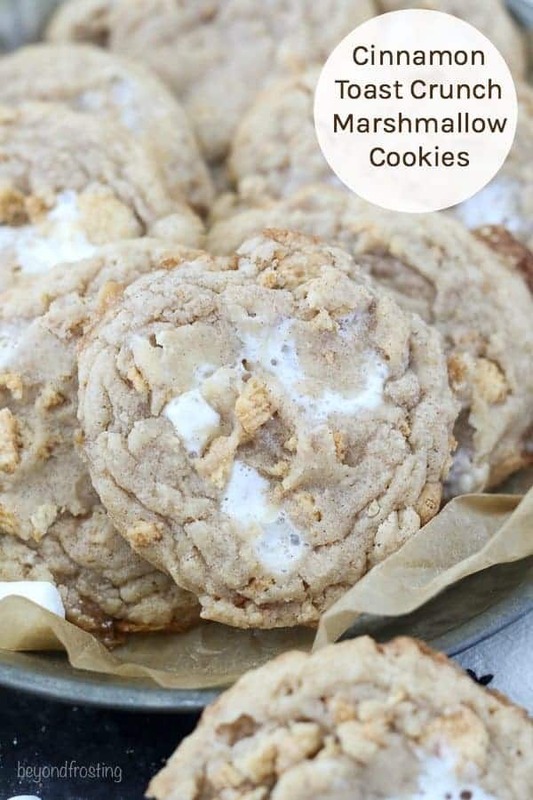 After baking these, the cereal pieces inside the cookies became very tough and chewy (not good!) and lost their crispness/crunch. Did I do something wrong? Any help appreciated, thanks! Hi Joseph, I don’t expect them to be crunchy, because when it’s combined with the ingredients and baked, it will lose some of that crunch. But I am surprised they were so tough and chewy. How small did you cut up the pieces? Donna that is AMAZING!!! Thank you! These sound great. Can’t wait to try a few of the others you have listed.